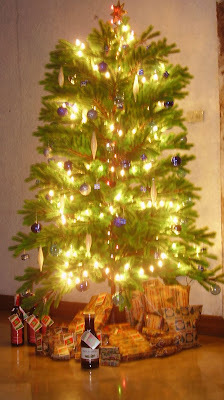 Baby Dust Diaries: Christmas tree oh Christmas tree! The week had been to busy for my hubby and I. We spent the week planning out gifts and our menu. Last Friday up to tonight were spent in buying and wrapping gifts. Shopping is always fun but during christmas season, its a mixture of fun, excitement and headache. Over the weekend, Christmas parties were all over. The streets were crowded with vehicles rushing to the malls for the last minute shopping. But you know what, I am coming down with a cold and everyone in the family has it. Some kind of a virus is going around for the holidays. Oh by the way, I missed my period but this is not new. I just noticed my breasts are sore just like the first time I got pregnant. Im gonna grab a HPT tom and I will keep you guys posted.